Pupils recently welcomed artist and activist Holly Budge to talk about her exhibition and fundraising initiative How Many Elephants? Children at St Swithun’s Junior School have signed up to a fundraising campaign to help protect African elephants. 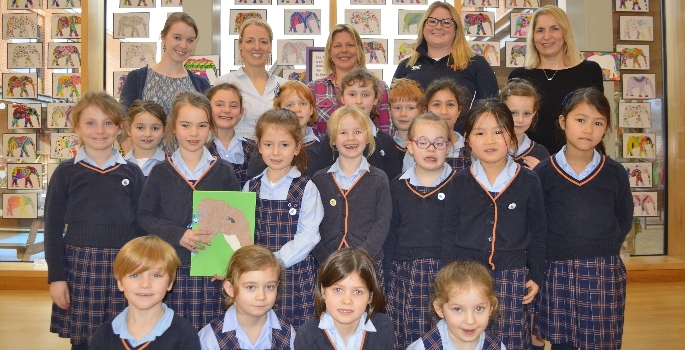 The pupils welcomed artist and activist, Holly Budge, to learn about her award-winning exhibition and fundraising project, How Many Elephants? Inspired by her work, every child from Reception to year 6 designed and coloured their own elephant to create a display in support of Holly’s campaign. 96 African elephants are poached in the wild each day for their ivory. At the current rate they will be extinct by 2025. Holly has turned this disheartening statistic into a powerful exhibition to raise awareness and much needed funds for elephant conservation. St Swithun’s pupils from Years 2 and 3 visited her gallery in Alresford and took part in workshops. They were inspired to join her digital petition and create their own exhibition, which they invited Holly along to see. How are independent schools using fundraising to make a difference?